от 10 шт. — 927 руб. Добавить в корзину 1 шт. на сумму 966 руб. HR10A Series high performance circular micro-connectors consisting of plugs, jacks and receptacles with a compact, lightweight and durable design. These miniature circular connectors have a single action push-pull coupling mechanism for quick and easy connection and disconnection. The push-pull mechanism also offers space savings enabling high density mounting of the connectors. 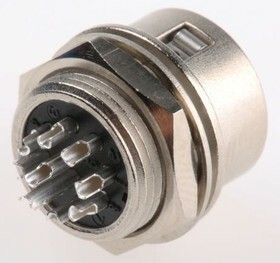 For accurate mating these HR10A circular connectors feature a five-key polarization system and the connection pin is protected against damage caused when blind mating. Crimping 7727115 is required for the brass strain relief to complete assembly.